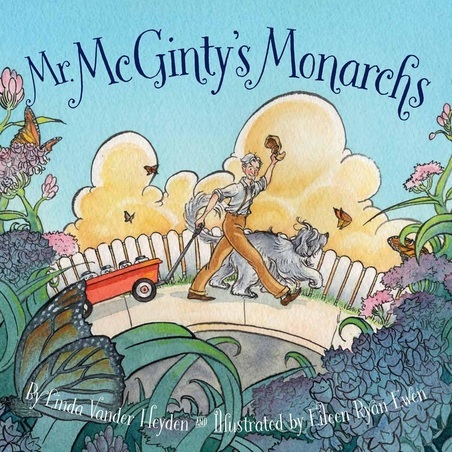 "Mr. McGinty and his dog, Sophie, perform a heroic monarch rescue...cheerful and detailed illustrations enliven the story and add important information." ﻿"Written for grades 1-4 and ages 6-9, Mr. McGinty’s Monarchs is as much fun as it is educational...This book should be great for science class, science labs, show-and-tell, citizenship, environmental studies, ecosystem studies, and…well, you name it and this book should cover it." In summer through late fall, milkweed grows lush along the sides of our road. Milkweed is the only plant monarchs use to lay their eggs. It is the only plant monarch caterpillars eat! One day, while walking with my dogs, I found all the milkweed on our road had been mowed. Monarch caterpillars clung to the drying plants. I began to gather them, hoping to save as many as possible. I wanted to tell their story. Monarch populations have dropped dramatically. It is my hope that MR. MCGINTY'S MONARCHS will not only entertain, but empower children, letting them know they can play an important role in the survival of these beautiful butterflies. Click on the butterfly to see a gallery of monarchs!